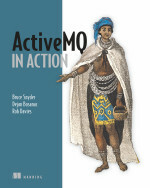 BruceBlog: 50% Off ActiveMQ In Action! Congrats! I just download the latest release. Great job! In our project, we have configured Mysql to be used in place of ActiveMQ's KahaDB by configuring the ActiveMQ's config file. Now, we have to store all the info for all the topics, queues, and passed messages etc. in mysql. How can we do that. Do we have to do all that through our java code or are there any configurations available which can be done at the Activemq side. @Kshitiz, You stated that you have already replaced the KahaDB persistence with MySQL persistence via the activemq.xml file. So I'm confused as to why you are asking me how to make this change. It seems to me that ActiveMQ deletes those messages of the topic which are delivered to the consumer, but we have to save some few "important" messages irrespective of their delivery status, so our doubt is actually about the process to achieve that. Do we have some example app or code for this approach, i mean using virtual destinations or mirrored queues to save all the topic/queue/passed message info to an external db like mysql. With mirrored queues, ActiveMQ will save a copy of every message that is sent to a given destination into a different destination. Those messages are then just sitting there. Then it would be up to you to decide how to use those copies of the messages. My guess would be that you could write an application to handle them. I'm not sure if you want to consume them from the mirrored destination, process them and decide which ones to save into a different database table or what. That is up to you.